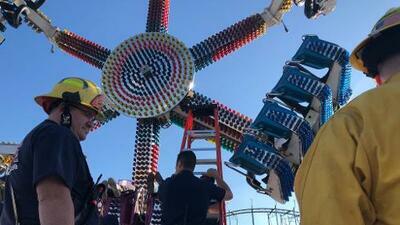 People are praising firefighters who helped nineteen people on the "El Nino" ride at the Washington State Fair after a malfunction left them hanging in the air around 6pm. The ride is known to turn riders sideways, around and upside down. Riders at the time described that the ride kept going round, and round more than usual and said that they felt tossed around rather than the smooth ride in normal operation. The also stated that the ride just suddenly came to a stop. "And everyone was freaking out." Augustina Boyer-Redman said "We were all worried that the harnesses were going to open!" Riders were stuck onboard for a total of 22-minutes. Officials stated that "El Nino" was the same exact ride that malfunctioned at the Ohio State fair in 2017 where one person was killed and several were injured.